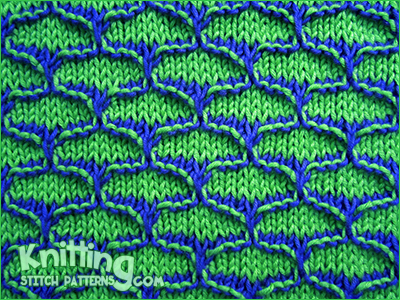 How to knit the Dip-stitch: Insert right-hand needle from front under purl loop of stitch 6 rows below next stitch, knit an extra stitch in this stitch; then knit the next stitch on the left-hand needle and pass the extra stitch over it. Knitted in a multiple of 8 sts + 3 and a 12-row repeat. Row 1 - wrong side: With color B, purl. Row 2 - right side: With color B, knit. Row 3: With color B, purl. Row 5: With color A, knit. Row 6: With color A, knit 1, * dip-st, knit 7; rep from * to last 2 sts, dip-st, knit1. Rows 7 through 10: With color B, repeat Rows 1 through 4. Row 11: With color A, knit. Row 12: With color A, knit 5, * dip-st, knit 7; rep from * to last 6 sts, dip-st, knit 5.